Hello again! 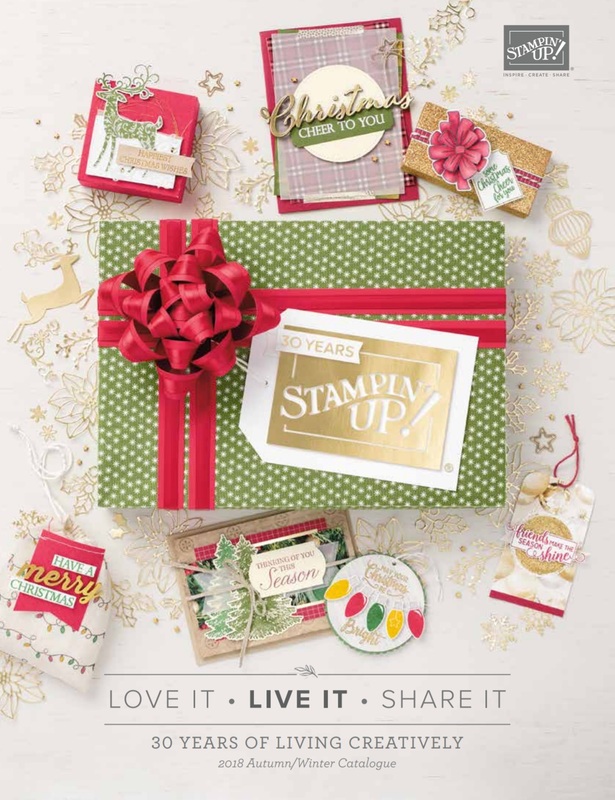 I was recently asked by Julie Kettlewell (my Stampin' Up! grandma!) to create some projects based around products in the Spring/Summer catalogue to showcase in her monthly newsletter. I chose the gorgeous Swallowtail stamp as I had yet to use it and it was one of the first things I bought when the catalogue came out! I had been a little bit intimidated by its size, but once I got stamping I found it really fun to use. I also wanted to try out lots of new embossing techniques that I had seen online - so most of the cards I made I have cased from other talented demonstrators. The first card was copied from the one in the catalogue. It is heat embossed with Pool Party embossing powder on the Summer Starfruit cardstock. It's a colour combination that works really well! You might just be able to see the champagne shimmer paint which I painted over the wings. 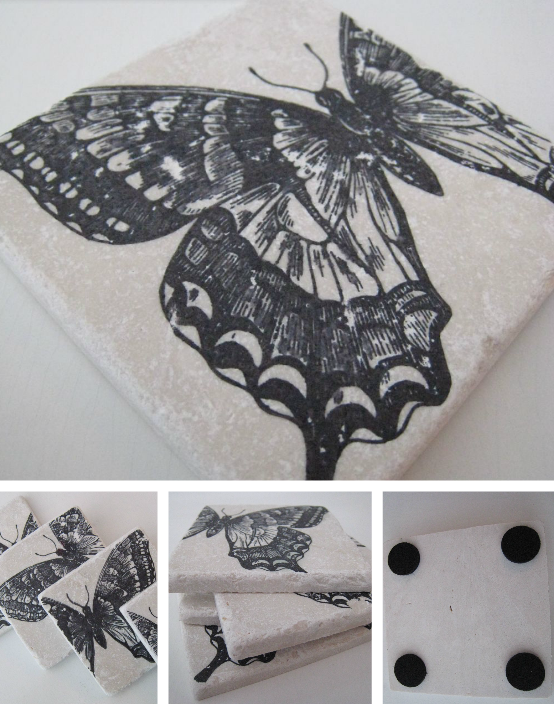 On the next card the butterfly was stamped with versamark and then heat embossed with white embossing powder. I sponged pink ink over the embossed image to make it appear! It's very subtle but quite pretty. The fourth card was stamped with versamark and heat embossed with black embossing powder onto designer series paper, and then the image was cut out. This next one turned out to be my favourite! Again I used black embossing powder but I added colour using the sponge daubers with More Mustard and Marina Mist ink. The colours blend together really well. The next card is similar to the last one, but it was coloured in using my aqua painter and Melon Mambo, Perfect Plum and Cherry Cobbler inks. I added a 'shadow' around the butterfly outline using the Sahara Sand marker - this simple step seems to lift the butterfly from the paper. I could have gone on forever with the cards - there are so many combinations of embossing, colouring and backgrounds you can try. But onto a couple of non-card ideas I tried out for this versatile stamp. I stamped onto some white shrink plastic with black Stazon ink. Then I cut out the image and coloured it with sponge daubers and ink. I placed the butterfly on a baking tray and put it in the oven. After about a minute the butterfly had curled up, shrunk and unfurled again. You can see the difference in size between the shrunk plastic and the original stamp! I attached a brooch pin with a blob of hot glue. I realised that I needed to 'fix' the colour somehow as it wasn't permanent and would rub off! My solution was to cover the brooch with a thin layer of Crystal Effects. It also gave it a nice glossy finish. My final project is also a bit of an experiment. I found a box of natural stone tiles in the loft that the previous owners left behind. I wanted to try stamping on them and I thought Swallowtail would look great. I stamped the image with black Stazon and then put the tiles in a low oven for about 20 minutes, then switched the oven off and let them cool in there. This was to 'fix' the stamped image onto the tile. I turned the tiles into coasters, adding felt circles to the back. I thought these would make nice gifts so I am going to try them out at my next craft fair. 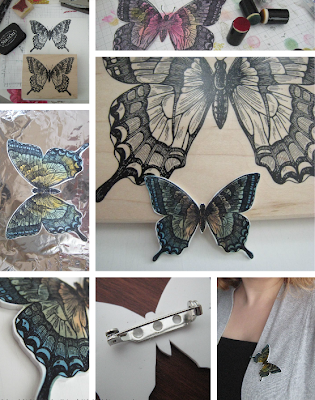 I hope you like some of these projects, and that it's given you some ideas for using the beautiful Swallowtail stamp. Hi Kylie, I love this stamp too. Am now inspired to go and find the shrink plastic! Your coasters are lovely. I love the tiles, and the butterfly that has been stamped onto the DSP. I can't wait to have a look at these cards, it's never quite the same seeing pictures on a screen.